Fueled by the vivid imagery of the every day world around him - from epic natural settings to chaotic mega-cities - Juergen has traveled the globe creating visionary work for clients like AUDI, BAYER, BLUE CROSS, BMW, BUICK, CHEVY, COCA-COLA, DEUTSCHE BANK, JAGUAR, LEXUS, MERCEDES-BENZ, RED CROSS, SMART, TOYOTA, UBS and many others. Juergen has embraced a uniquely naturalistic tone in all his work – a heightened realism, which seeks to reveal grace in the ordinary. His pure and powerful imagery has captured everything from sleek automobiles to the ever-changing contours of the human face. Melding classic broadcast commercial work with groundbreaking alternative and viral projects, Juergen was a creative mind behind a series of revolutionary internet virals for Daimler’s SMART car. Establishing a long-lasting relationship with ZDF (2nd German Television), one of Europe’s biggest TV stations, Juergen’s award-winning station IDs would go on to define the face of both stations for many years. 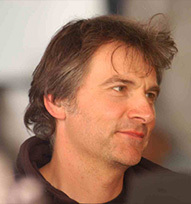 Juergen’s work has garnered accolades around the globe, including the ART DIRECTORS CLUB OF GERMANY, the LONDON INTERNATIONAL ADVERTISING AWARDS, as well as several GOLD AWARDS at the US INTERNATIONAL FILM FESTIVAL, the GRAND AWARD at the NEW YORK FESTIVALS for MERCEDES-BENZ SLR MCLAREN, the 2012 CLIO AWARD and a CANNES SILVER LION at the 2014 LIONS HEALTH for STRYKER.